Local histories can be invaluable and are usually worth the extra effort it takes to track them down. 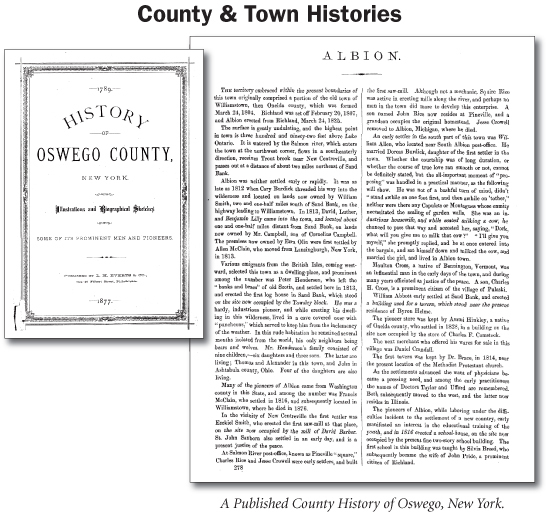 County histories often consist of two sections. The first being a history of the county and arranged by towns or townships, and the second part being biographical and containing profiles of prominent founding fathers and families who lived there when the book was published. These histories are valuable because some of the information may have been obtained directly from local individuals, who may have had firsthand knowledge of the facts. However, the genealogy portions often contain errors. (see “Tip” below). Many town and county histories were produced for either the American centennial in 1876 or the town/county centennial (whenever that would have been). Others were produced as scholarly works, while others were produced as subscription publications. TIP: Many of these histories (particularly the genealogy portions) were compiled by interviews or from questionnaires and the information was not edited or verified independently—therefore, the information might be wrong. That’s why you need to check any family history information they contain with primary and/or good secondary sources. Finding copies of local histories can force you to hone your detective skills. Many are out of print and few libraries offer them on interlibrary loan. 3) Local Library — contact the local library where your ancestor lived. They’ll usually have an excellent collection of their local histories and will might make copies for you if you specify the surname you’re interested in. Step 1: Check to see what histories have been printed. Step 2: Order through interlibrary loan.